If Donald Trump doesn't care about "being isolated," then G7 may be better being G6, says Emmanuel Macron. The French president slammed US counterpart for "unproductive" tariffs and preventing other nations from dealing with Iran. "The six countries of the G7 without the United States, are a bigger market taken together than the American market,” Macron said, standing alongside Canadian Prime Minister Justin Trudeau. “I would like to say Mr. Trump that the measures taken are counterproductive. Macron had previously attempted to strike a more conciliatory tone with Trump and was even dubbed the “Trump whisperer” by some in the media. Now, he went on to say there would be no “world hegemony” and that the six other countries, excluding the US, represent “a real force at the international level” today. Despite early hopes, Macron has not had the influence on Trump that some were expecting. He was forced to watch on as the president dropped out of the Paris climate accord and tore up the Iran nuclear deal, which Europe had desperately hoped the US would abide by. Trump’s move to impose tariffs on imports of steel and aluminum from the European Union, Canada and Mexico seems to have been the last straw, however. “If you are not comfortable with the agreement [on Iran] signed by your predecessor, do not prevent other people from keeping it and do not push Iran out of it. That is the best option we have today,” Macron said during the joint press conference with Trudeau. 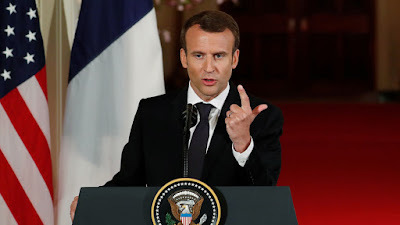 However, the French leader apparently did not also rule out amending the deal by what he called reaching a “broader agreement” with the Islamic Republic, which would particularly cover its activities in the region. “We will have to work all together on a broader agreement with Iran and [other] countries in the region, our allies,” he said, apparently referring to the Gulf monarchies. “We have to look at the future there, we have to look at what happens in Syria, Iraq and Lebanon and we have to find a way to work in this extremely tense context,” he added. At the same time, the president also praised Trump’s decision to hold a meeting with the North Korean leader Kim Jong-un.